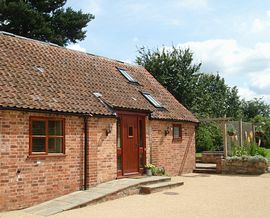 The Little Barn is situated in the pretty South Nottinghamshire Village of Wysall. The property stands adjacent to the original farmyard of Rectory Farm, a Grade II listed building. Large living/dining/kitchen room with feature original beams and apex ceiling. The floor is polished pine. Double doors open onto a screened patio with open outlook onto garden and tennis court. 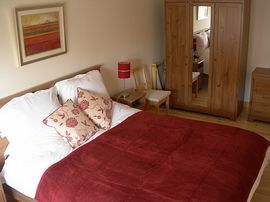 The large double bedroom has a king size bed and there is ample room for a cot or child's bed if required. 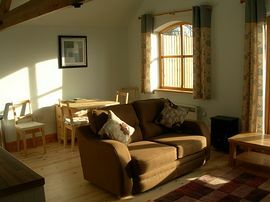 All bedding and linen is provided and changed weekly. The shower room is accessible from bedroom and hallway. It has a highly efficient heated towel rail. Towels are provided. There is a full sized airing cupboard. There is a pretty Norman Church in the village centre and an excellent pub, which serves meals at lunchtime. Original beams in a fresh clean new barn conversion. 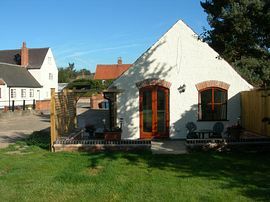 Quiet village setting close to East Midlands amenities. Property all ground floor level. Ramp to front door. Full service bed linen and towels. Local Services: Pub serving lunch time meals. Routes to Wysall from the M1, A60 and A46 are in full detail on our website. East Midlands Airport 15 miles. 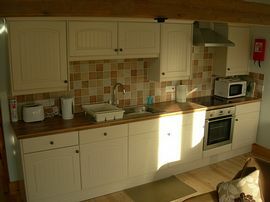 £300.00 per week all year round. Start day by arrangement subject to availability. Child bed or travel cot available inclusive in tarriff.